Built around 1870, this Italianate house – a style that proved so popular during the 1850s and 1860s – has retained much of its original detail and all of its original charm. Among the picturesque touches include the bracketed eaves, the decorative door and window trims, and the projecting bay windows. The house was first associated with Hiram Cook, who moved to Verona following the Civil War and became the first to turn Verona Lake from an ordinary mill-pond into a recreation center. Later owners William P. Rich and William Johnson were local businessmen in the early 20th century. Constructed in the late 18th century, the Enos Martin House still retains the exposed fireback on its end wall, a key feature in early-farmhouse architecture. The store-and-a-half frame house has been added on to through the years, but is still a classic example of the “East Jersey Cottage” form typical of Essex County colonial domestic architecture. Located on what was formerly known as Old Road in the 18th century, this house is architecturally significant because the alterations and addition (circa 1880) skillfully preserved the inward portion in the old style while updating the exterior in the Victorian style. Surrounding the house is a row of antiquity maple trees that are more than 150 years old, as well as a white picket fence lining the front of the property. past the original portion of the old house on their way from Cranetown to Morristown during the Revolutionary Period. John Range was the first owner in 1797 before Josiah A. Priest’s purchase in 1873. Priest’s widow continued living in the house until 1919, when his daughters took over possession of the home. In 1926, the home was purchased by Alfred F. Harris who resided in and preserved the home for over 40 years. Harris’ chronicles written in 1963 describe in detail the older portion of the home, the addition in 1880, the foundation, the cellar, the attic and roof, etc. Likely constructed around 1790, this beautiful example of an early-19th century vernacular farmhouse in the Township of Verona still retains the characteristic form and materials of this style of architecture. The steep gable roof, step-down form with main block and smaller attached service wing on the south side of the house and small second floor windows on the front are all characteristic of the house type known as and “East Jersey Cottage”. 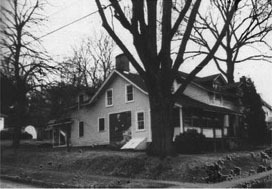 This house matches the Harrison house (circa 1790) in West Caldwell at 153 Orton Road. 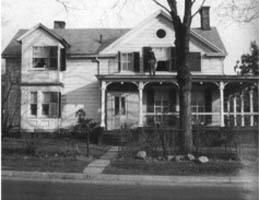 The small, eyebrow-window-sized locations and chimneys are identical to those in the photo of the Harrison House taken by the Historic American Building Survey in 1937. A Greek revival entablature and trim around the entrance at 190 Grove Avenue must have been removed at a later date. 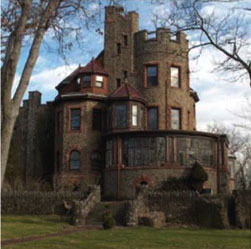 Located at 22 Crestmont Road, Kip’s Castle Park (originally known as “Kypsburg”) was constructed between 1902-1905 by Frederic Ellsworth Kip and his wife, Charlotte Bishop Williams Kip and is now a highlight of the Essex County Park System. Frederic was a wealthy textile inventor and industrialist who also published several books related to United States tariff laws. Charlotte is credited for the design of the “Kypsburg” building and grounds, cultivating a renowned octagonal rose garden in the southwest corner of the property. After Charlotte’s passing in 1926, the estate was sold and went through several owners. Currently, the 9,000 square-foot mansion replicates a medieval Norman castle. The interior of the castle consists of 30 distinguished rooms of varying shapes, which include vaulted ceilings and six ornate fireplaces. In addition, a 6,000 square-foot carriage house is also located on the property. The mansion and carriage house are unique and splendid examples of the romantic, medieval-revival. The stone gates, retaining walls, serpentine drives, and gardens add to the composition, uniting it with the rugged site while allowing the natural character of the ridge to prevail. The castle is constructed of local trap rock trimmed with sandstone. Its huge corner turrets and walls are pierced with arches and deep-set windows. A large stone veranda, the roof of which is supported by round sandstone pillars, surrounds the front of the building. The massive, southeast turret can be seen from miles around. The interior woodwork of the castle is of old English quarter-sawn oak. The front hallway contains stained glass windows and a huge stone fireplace. The master bedroom suite on the second floor has eight large windows which face the New York City skyline. According to the book “History of Verona” by Grace Kass, “the original Captain William Pease purchased a large tract of land (circa 1847) running up the hill from the west side of Verona Lake almost to the present Essex Fells line.” This land comprises nearly one-quarter of the land that makes up present-day Verona and thus is some considerable historic significance. Gilbert Pease built the house, located at 66 Lakeside Ave., on the corner of Lakeside Avenue and Pease Avenue in 1893 and lived there until he was 90 years old. This house maintains several, significantly unique architectural features. There are seven ceilings with different patterns pressed into them that are original to the house. There is also tin trimming in the upstairs hallway and bedrooms. The gas fixtures are still found attached to the bedroom ceilings. The original old hinges and doorknobs are still found on the doors. The bedroom door is higher than the closet door. The stairwell layout was changed many years ago from a narrow stairway that turned at a landing to a wider, longer, straight stairway. However, the old banisters were retained. The cellar has four-by-eight inch beams that are 16 inches on center. It also has brick piers made out of 12-inch brick. The height of the cellar is six-feet, one-inch. This landmark boulder sitting high atop the Second Mountain is the centerpiece of a stunning environment, as well as the focus of local stories and history concerning its use as an important meeting site. No written records have been found about early activities at The White Rock. 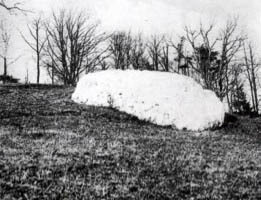 However, according to stories that have been handed down from generation to generation, The White Rock was supposedly one of the first religious meeting places in Verona in the early 1800s. For many years the land around and below the White Rock was cleared, thus providing an excellent view of the Verona Valley. Today, the landmark boulder sits in obscurity shrouded by trees that protect it from the modern sights and sounds in the valley below. As the true center of town, the Verona Civic Center is both architecturally and historically significant. Conceived as a formal “square” off Bloomfield Avenue in 1923, the current-day Verona Civic Center includes H.B. 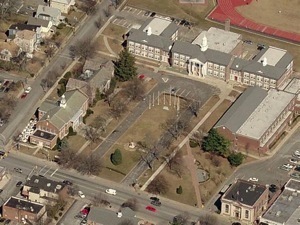 Whitehorne School, the Verona Public Library, and Verona Town Hall housed within a scenic, park-like setting. The traditional, Georgian Revival style of the buildings within the Verona Civic Center dates back to what was popular in American architecture: Although Verona was a new township, its roots extended back into the 18th century. Completed in 1924, the Verona Civic Center’s formal plan tied in with the City Beautiful movement prevalent in early-20th-Century American architecture and planning that provided a true center of town. A bronze statue honoring Verona residents who served in World War I was constructed. One of the highlights of the Verona Civic Center is the Verona Public Library, one of more than 25,000 libraries nationally funded through the Carnegie Corporation between 1883 and 1929. Although rising construction costs during World War I initially delayed plans, the Verona Public Library became part of the Verona Civic Center’s beautiful landscape. The history of Verona Park can be traced back as early as 1814, when Doctor Bohn dammed the Peckman River, which was an old swamp for a grist mill. The water behind that dam formed a 13-acre Lake. Later this beautiful lake surrounded by weeping-willow trees and winding paths became an ideal location for family activities. 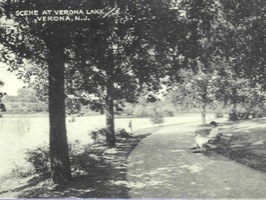 Verona Lake proved a popular attraction for weekend picnicking by the 1890s, with commercial boathouses and concession stands. Meanwhile, the Trolley that ran up Bloomfield Avenue from Newark brought additional visitors. Verona Lake Park’s first land acquisitions occurred in 1920; this action was delayed only due to economic conditions caused by World War I. Initially, acquiring part of this land owned by the Erie Railroad Company required an agreement allowing the ERC to retain a right-of-way across the park by means of a bridge. (Sketches showed a bridge with a series of high arches that spanned the lake and roadway.) Fortunately, this bridge never materialized. Instead, the existing arched pedestrian bridge over the lake presents a quaint architectural highlight. Local citizens conceived the idea of a formal Verona Lake Park around the lake, joining with the Essex County Parks Commission to purchase enough land by the 1920s to bring the total area of the Park to 54 acres. Essex County later brought in the Olmstead Brothers Landscape firm to design a showcase public space, just as the Olmstead Brothers had done for New York City’s Central Park a generation earlier. The landscape plans prepared by the Olmstead Brothers were approved the same year Verona Park was acquired. Actual development did not start until several years later due to court proceedings concerning condemnation of some of the land. There was no inconvenience to the public during the delay because the park was already being used for boating, bathing, skating, picnics, and band concerts. Part of the Verona Civic Center, the Verona Public Library is a fascinating example of Georgian Revival architecture that proved so popular when it was constructed in 1923. 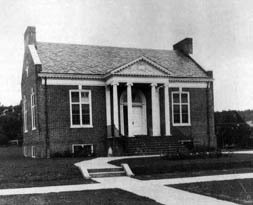 The Verona Public Library was one of 25,000 libraries nationally funded through the Carnegie Corporation between 1883 and 1929. Through an $11,000 Carnegie grant and public subscription, a lot on the corner of Bloomfield and Montrose avenues was purchased. Architectural drawings were drafted. However, the sudden rise in construction costs at the outset of World War I initially prevented the project from moving forward. Eventually, construction commenced in 1922. Instead of the initial location of Bloomfield and Montrose avenues, the Verona Public Library was included as part of the Verona Civic Center.